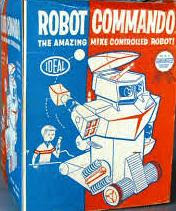 Ideal's Robot Commando -- "The amazing mechanical man" -- arrived in toy stores across America well before my time, at the beginning of the sixties. Although I've never owned one of these toys, that fact hasn't changed my admiration for this retro-futuristic Marvin Glass creation. Joel and I often surf Youtube together looking for old toy robot commercials, and we came across this fellow a few years back (as well as Ideal's the Great Garloo). Standing an impressive 19" tall, Robot Commando "responds to commands" by pressing a control lever and speaking into a microphone. He can also fire rockets out of his eyes (black marbles) and make beeping sounds. 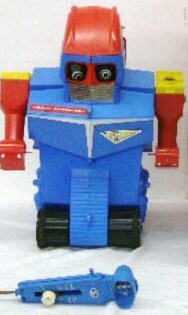 Cast in blue and red plastic Robot Commando moves about on rubber wheels and operates on three D batteries. Once -- on November 5, 1961 -- the big metal guy even made the cover of the Chicago Tribune Magazine with his creator. Below that image, you'll find the great Robot Commando commercial. The rocket was fired from the top of RC's head--not his eyes--and don't forget the balls hurled by his arms.